The following are answers to frequently asked questions regarding the free reports section of the site as well as here. For video instructions and information about double-checking time zones, see this page. I have been offering free reports on my site since 2002, and I truly hope you enjoy this free service! 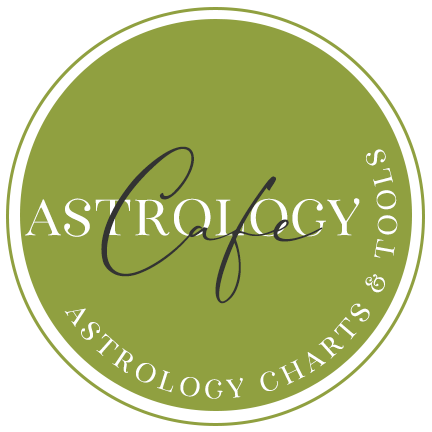 While some things have changed over the years, the following are answers to the most frequently-asked questions regarding the report-generating tools on Cafe Astrology. My location is not in the atlas. If this is the case, please write to [email protected] for a workaround. However, your first step can be to check that you are seeing the full list of locations. It’s important to enter only the city name and nothing else into the city field. On most browsers, a city list will drop down once you do, but on some and mostly on phones, you need to click/tap on the small arrow to see the list of choices. As well, it’s important to note that small differences in location are typically equivalent to a fraction of a minute of birth time and, of course, we don’t record birth times with such accuracy! For example, if you were born in a suburb of a major city, this can amount to a difference in a birth time of 7:00 PM and 7:00:20 PM. 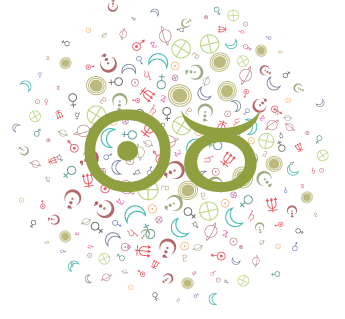 In the rare case that the tiny difference DOES change the Ascendant sign, then your Ascendant sign is ambiguous regardless unless you know the second you were born, and most of us do not. A small difference in location will not change this. What is a small difference? That depends, but often there is little change in the chart for a location that’s within about 50 miles of another one. If there is a change of one degree or so and you are concerned about this difference, simply write to [email protected] with your complete birth information and Kristen will let you know if you need to adjust the birth time by a minute or two and in which direction. If you were born in a suburb of a major city, you can use the city as your birthplace with negligible differences. 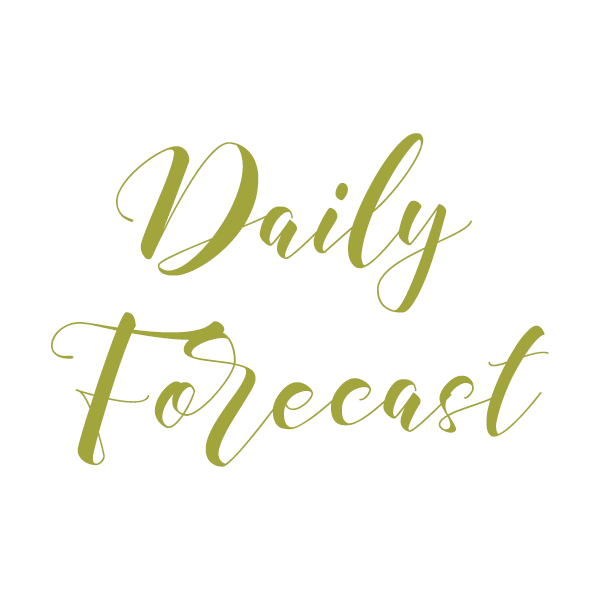 Fine-tuning the location is especially fruitless if you don’t know your birth time or you are working with an approximate time of day. Also, be sure that you are entering a city and not the country, county, province, or region into the location field. For example, if you were born in Toronto, Ontario, Canada, enter only “Toronto” and then choose the correct Toronto from the list on the next screen. Do not enter Ontario, Canada, or any other refinement. Simply enter the city. Sometimes cities have varied spellings or have changed names in recent years. Usually, you can run a search on a city name and Wikipedia may list its variations. If you can’t find a small village, city, or CDP and you’re unsure of a larger city that’s close to it, you might try LatLong.net or Sat-Sig. These are excellent tools for entering a location to get its coordinates. Once found, you can zoom out just enough to see cities that may be close to the birthplace in question. Update: The latest version of the birth location field requires you to type in your city name and select the correct location from the list BEFORE clicking OK and moving on (the list auto-populates). Again, enter the city only and look for your location in the list. What time should I use? Local time. This would be the time that was on a regular clock when and where you were born. Please don’t adjust the time to your time zone or to the birth location’s time zone or the results will be incorrect. How come only US locations are in the atlas? They’re not. The software’s atlas is international. It can sometimes appear that the software is only for people born in the United States when too much information is entered into the location field but it’s not the case. When too much information is entered into the location field, the list of possible locations is reduced. Enter the city name only into the location field for best results. If you’re unsure of the spelling, you might try looking it up online or try entering only the first few letters of the city name into the field. There can sometimes be many cities with the same or similar name and you have to scroll to find the results you want, and this can be the reason you’re seeing only US locations. In fact, unlike most countries in the world, the US has a large number of cities with the same name. For example, if you are looking for Belleville, Ontario, Canada, after searching for “Belleville” the dropdown list reveals 19 cities named Belleville, of which 17 are in the US! The other two are in France and Canada. With only a quick glance, it can be easy to conclude that the locations are only for the US, but it is only because the US has so many repeated city names. If you can’t find your location, see the first question on this page, above. The timezone is noted as positive when it should be negative/The time zone is noted as negative when it should be positive. 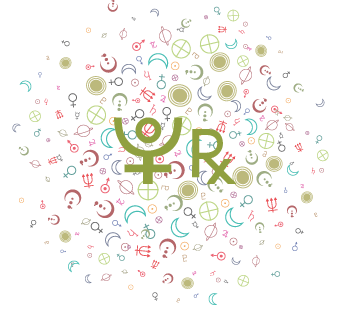 It is important to understand that you are inputting local time into astrology software. 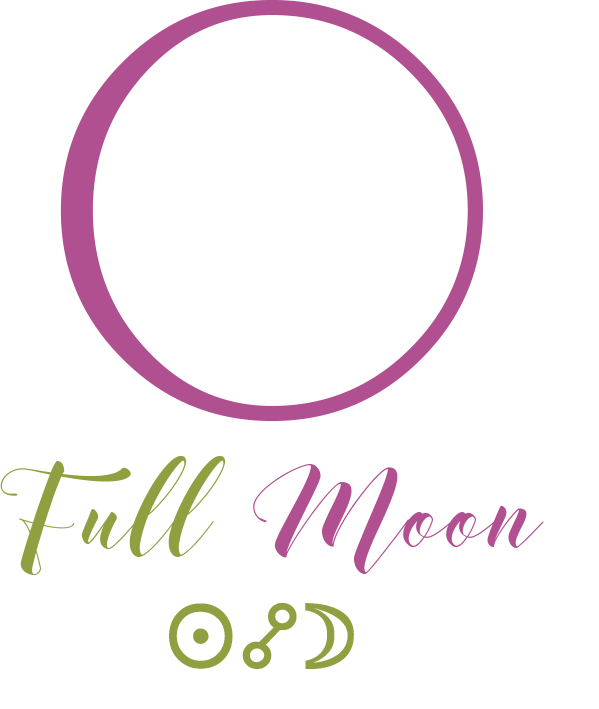 The astrology software needs to convert local time to GMT/UTC. For example, for Saigon, Vietnam, the time zone is UTC + 7. This statement is absolutely correct. In other words, Saigon time = UTC + 7. However, if you are putting Saigon time into the software, the software needs to convert this time to UTC. In order to do so, it will subtract 7 hours from Saigon or local time. UTC = Saigon time -7. The statements are equivalent; we are simply determining different values. Example: If it is 12 PM in Greenwich, it’s 12 PM UTC. In Saigon, it would be UTC + 7, which is 7 PM. Let’s say a person’s birth time is 7 PM in Saigon. This is the value you would enter into the software. The software would need to convert this value to UTC, and to do so, it would need to subtract 7 hours to arrive at the correct value of 12 PM UTC. As a result, on your report, you will see the value of -7. This does NOT contradict the statement that Saigon is UTC +7. Instead, it supports it. The software is converting local time to UTC and not the other way around. By switching around the +/- connotation, you are not getting the correct results, and your chart is wrong. I emphasize this only because this is a very common, persistent issue. There is a mistake – Aries is on the 5th and 6th houses (or [this sign] is on two different houses). Aries is on the cusp of both houses V and VI (houses 5 and 6). 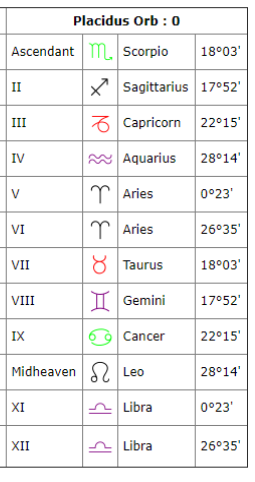 This also means that Aries’ opposite sign, Libra, is on the cusp of the houses opposite to the 5th and 6th houses, that is, houses XI and XII (houses 11 and 12). 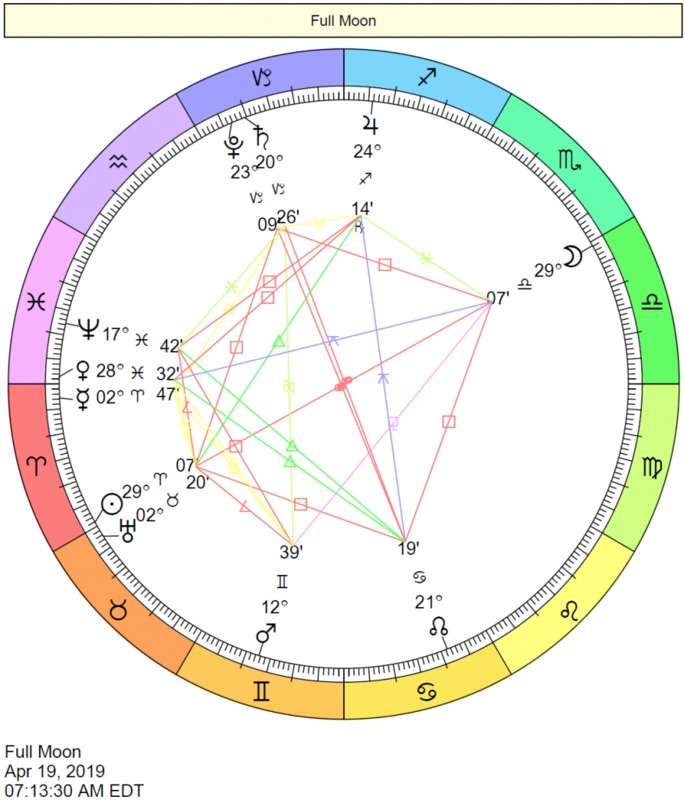 When this happens, two signs of the zodiac will be missing on the cusp of the houses, but present in the chart as all signs are found in each chart. They’re simply hidden, or, more officially, intercepted. In the example above, Virgo and Pisces are not found on house cusps. However, they ARE found in the chart, they’re just intercepted. In this example, the fourth house completely contains Pisces and the tenth house completely contains Virgo. For example, house IV (the 4th house) begins at 28 degrees Aquarius and 14 minutes and ends when house V begins (at 0 degrees Aries and 23 minutes). A sign spans 30 degrees, so house IV includes the last almost 2 degrees of the sign of Aquarius, the whole of the subsequent sign (Pisces), as well as part of the first degree of Aries. For a full explanation of duplicated signs and interceptions, see How to Read/Understand the Chart Wheel. A planet in Aries [or another sign] is not found in the house that shows Aries [or another sign] on the cusp. This is another situation where gaining an understanding of the houses and how they work in a system such as Placidus (default in the free report section), Koch, Porphyry, and many others is essential. Example: Venus is in Aries and is shown as in the eighth house, but Pisces is on the eighth house cusp and Aries is on the ninth house. This happens frequently and is correct. If you’d like to learn why this happens, please see How to Read/Understand the Chart Wheel. My Ascendant and Houses are not what I expected. It’s important to note that there are some issues of accuracy of time zone information in all astrology software programs. It’s a good idea to check that the output is accurate, or as accurate as we can assume since there are ambiguities with some years and locations. It’s a good idea to double check, and Kristen can help you with this (at [email protected]). 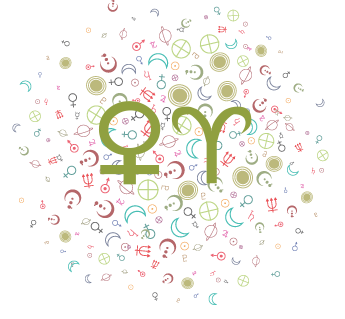 Most astrology software is mathematically accurate. As such, when there are discrepancies between programs, it’s usually due to different time zone offsets used (most frequently, it’s an hour’s difference). When time zones are different, you’ll see the biggest change in the Ascendant, so that’s the first place to look. It’s important to note that the current time zone for a location is not relevant since it’s the time zone offset that was in effect at the time, date, and year a person was born that is what we need. There are several places to look up or research historical time zones. There is a tool on our site here: Time Zone lookup. You can also find some historical data at Time and Date. The history of Daylight Savings Time is complicated. Laws to standardize it only passed in the US, for example, in 1966, and before then, it was chaotic. The accuracy of historical time zones is strongest for birthdates from 1970 forward. There is a Profile Number but no PIN. What is my PIN? As stated on the pages in the free reports section, it’s important not to rely on the site saving your data. A semi-account system (not full) is currently in place for the convenience of people using the Free Reports section. This way, people don’t have to constantly re-enter birth data, which was the case for many years before I changed over to the new system in 2016. However, this is not a full account system — we don’t ask for email addresses or information to identify your charts. Instead, your session is assigned a profile ID and PIN through a cookie and if you clear your cookies, there is no way of retrieving your saved chart data unless you noted down both your profile ID and PIN with which you can sign in. Otherwise, the data is inaccessible. As such, please don’t depend on the system to store data that you haven’t taken note of somewhere else. I cannot retrieve old profiles. If there is a profile ID and an empty PIN number, that means your old session was cleared and you’re now assigned a new profile ID. In this case, you’ll need to start over. You can re-enter the same chart data and generate as many reports as you’d like. The City Field Populates with a Location that’s not Mine. Mostly on phones, the location list may not drop down unless you click on the small arrow next to the location’s name. This is due to the different behaviors of different browsers for handling forms. You are not stuck with that first city on the list. Clicking on the arrow will reveal the entire list of cities with that name, and you can select the correct one from that list. See Also: Using the Free Report Section.